This is our favorite diaper, after we loved the newborn version too. Never leaked! (unlike other diapers where the insert sometimes shifts (or elastic gapes a brief moment) and a forceful pee might escape) Our boy is now a chubby 20lbs 6months and has room to grow. It is my safe and simple go-to diaper I pack for easy use for staying with grandma, or playing or napping without worrying about accidents. We used to tuck in the insert, but after some redness we've been using the stay-dry side more and have had no worries since! Washes well, dries quickly, gets nice and white again in the sun easily if needed, I wish I had only these! Although there are trimmer/slimmer diapers, these are not too big and we've been able to fit pants well, even though non elastic pants might need a bit more effort to slide into place. Best one size all in one! Our favorite one size all in one! Great fit, no leaks, fast drying, cute prints. Only thing I would change is the microfleece layer, as it adds some bulk and we prefer natural fibers, but you can tuck the fleece in. All in all, a great diaper! Got one of these as a Christmas gift and they may be my new favourite - I wish I'd discovered them much earlier! They never leak for my heavy wetter, and I love the stay dry option. I haven't needed to add extra absorbency, but I love that the option is available. This is a very absorbent diaper which we use a lot for naps. I like the option of having stay dry or cotton against baby's bum. The only reason I gave 4 stars instead of 5 is because I find that the insert never agitates out in our FLer. I lock these diapers! So simple and almost never gets leaks. We use them for daycare and our daycare provider loves them too. They fit my 18 month old so well. I have tried many brands but these are by far my favourite. I love how these AIOs have the advantages of a pocket diaper without the hassle. 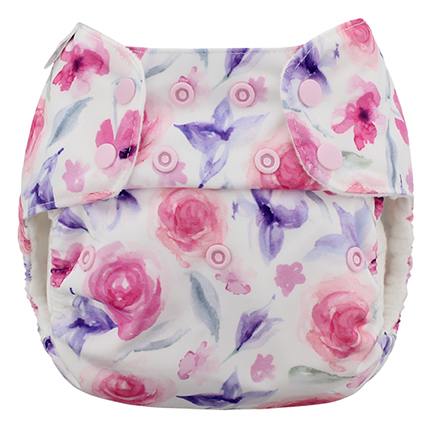 They are quite versatile as you can use the insert in or out of the pocket depending on which textile you want against baby's delicate skin. You may even add a doubler if needed. I find they dry quickly compared to other brands I own. The veggies and snails prints are so cute and the fit is perfect for my LO. This is a great diaper. It's not one of my favourites but I've never had a leak and it's pretty trim. The prints available are awesome. I like this because it the rise is high so it is great for taller babies, it did not fit really well until my daughter was about 15 pounds. They are very leak resistant, I have had the occasional leak out the legs, and the absorbency is very adjustable. All my inserts fit in this diaper. Dry time is medium I would say but very good for an all in one. The cotton is easy to keep clean/stain free. it is a little bulky if inserts are added to the tongue. This disper is decent but not my favorite. The soaker pad seems to be a little long and tends to stick out a little regardless if its tucked in the pocket or not. I have to have it just right which takes more time than i would like so i tend to grab for it last or when im not in a rush. It does fit well and i havent had any leaks. The absorbency of these is decent but I still had to add an additional insert. 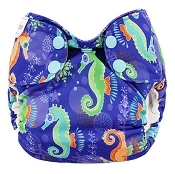 It needs a stay-dry liner or baby will feel wet against skin. I also feel like the natural materials on the inside shrink and pull the diaper slightly in on itself. I also have to make sure i really get the diaper into the leg creases on my chunky-thighed 7 mth old. I have to turn the diaper in on itself (like jelly-rolling a flat) because the inner part always somehow manages to sneak out and cause wicking leaka. I would try blueberry pockets but would probably skip on these because of the price and having to add absorbency anyway. These are a decent aio, though.